All of our products are available for purchase from our website. Click here to visit our Online Store and select from the 30 flavors available. If you own a retail business our products are available in wholesale quantities. Click here for more wholesale ordering information. 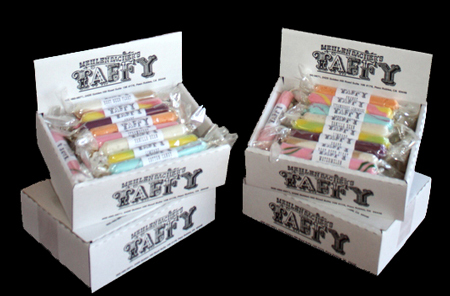 If there is a Gift Shop or General Store in your area that you think should sell our artisan taffy, e-mail us with their name and mailing address, and we will be happy to send them a sample. We have retailers nation-wide. For small orders, if you want to know where you might purchase locally a stick or three, e-mail us and let us know the big city near you. We will let you know who is the closest local retailer near you.